New offering by University Games gets yanked from Target and Toys R Us. 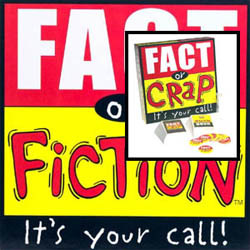 Fact or Crap renamed to Fact or Fiction. October 4, 2002 - New Game Fact or Crap, By University Games Gets Yanked From Toys R Us and Target. University Games, makers of the popular games 20 Questions, Worst Case Scenario for Survival and Battle of the Sexes, acknowledged today that thousands of Fact or Crap games were returned by two of America's largest toy retailers, Toys R Us and Target Corp. Fact or Crap, a fast-paced trivia game where players must determine whether bizarre statements are true or false, was released by University Games just three months ago when the two retailers pulled the plug. According to University Games president Bob Moog, 'both Toys R Us and Target decided to stop selling the popular game because of the word 'crap' in its title. They had received a few complaints from customers who were offended by the word 'crap,'' Moog continued by saying, 'We are working with both retailers to find a suitable alternative like 'phooey' or 'fiction.' We try to be innovative and edgy and sensitive. It's ironic how our strongest marketing tool turned into our worst nightmare.' The game's fate is yet to be determined, however. Hundreds of retailers are stocking the game and reordering weekly. University Games was founded on April Fool's Day in 1985 by Bob Moog and Cris Lehman. Today, University Games distributes more product in more outlets, in more markets than any other game company. The company now has four divisions -- University Games (board games/travel/card games), Great Explorations (science and learning / novelties/ Glow-in-the-Dark products), Bepuzzled (puzzles), and Colorforms (vinyl stick-on play sets, board games/travel, floor puzzles). In 1995, 1996 and in 1999 University Games was named one of the top 150 fastest growing companies by the San Francisco Business Times, and in 1996 was named one of the fastest growing private companies in America by Inc. Magazine. University Games has also won numerous toy awards through Parent's Choice, Family Fun Magazine, Child Magazine, Parenting Magazine and Dr. Toy to name a few.